On June 25, 1950 the North Korean People’s Army crossed the 38th parallel and pushed relentlessly southward down the peninsula, driving before it the demoralized Republic of Korea Army. With his forces confined to the “Pusan Perimeter” General MacArthur decided to launch a surprise of his own. He organized an audacious amphibious attack with the Army and Marines hundreds of miles behind the communist lines at the coastal town of Inchon. D-Day was set for September 15th. The 230-ship task force was the largest naval armada since World War II. The Marines from the 1st Marine Division would lead the assault. As briefed, the assault force encountered the 10 foot high sea wall meant to keep them out. 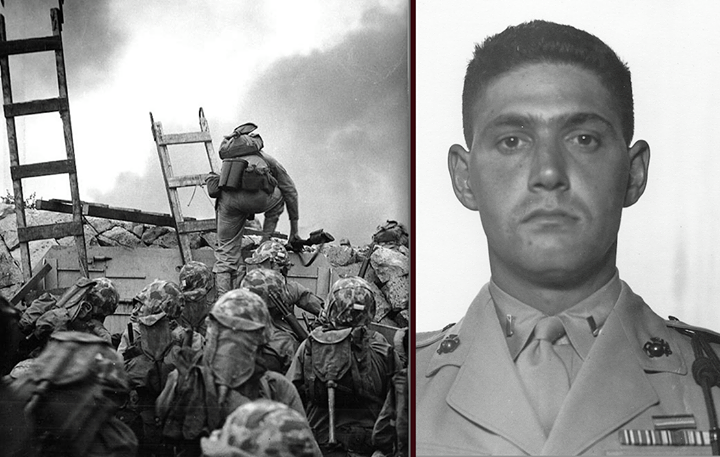 In typical Marine fashion, 1stLt Lopez, was the first up and over the wall. Unfortunately, moments after this photo was taken, 1stLt Lopez was hit. He was attacking a North Korean bunker with a grenade….as he raised his arm to throw, machine gun fire ripped through his right arm and chest. The Marine Officer fell backward and the grenade rolled out of his hand. He tried to pick up the grenade but his arm was too badly wounded. In a few precious seconds he knew that the grenade would explode and kill many of his fellow Marines. With a sweep of his wounded arm he pulled the grenade into his chest, wrapped his body around it, and absorbed the full impact of the blast. For his actions above and beyond the call of duty, for sacrificing his own life to protect his men, for sacrificing his life for his country and for freedom, 1stLt Lopez was awarded our nation’s highest honor–the Congressional Medal of Honor. 1stLt Lopez is also remembered every 6 months at the Marine Corps The Basic School (TBS) graduation. The Lieutenant Baldomero Lopez Honor Graduate Award, is presented to the Marine Officer of each graduating company who demonstrates the highest potential for future leadership and responsibility in the Marine Corps. Thank you 1stLt Lopez for allowing your life to stand as a testimony to the timeless message that leadership requires sacrifice.